Was I in for a shocking surprise! This seemingly decadent mousse is made out of … are you ready for this? Avocado! “What! ?” I should have guessed, because not only is my friend Rosanna a nutritionist, but all of her cooking is gourmet. Thank G-d she revealed the secret while my kids were off playing, because I’m not so sure they would have allowed me to make this later at home, had they heard the secret ingredient haha! Bueno, que si me pegué una sorpresa. El aparentemente decadente mousse esta hecho de… ¿están listas para esto? ¡Aguacates! “¿¡Qué!? Debí haberlo adivinado, puesto que mi amiga Rosanna, no sólo es nutricionista, sino que toda su cocina es gourmet. Gracias a Di-s que me reveló el ingrediente secreto cuando ya mis hijos habían salido de la Suká y estaban felices jugando por otro lado. De haber escuchado cual es el ingrediente secreto, no me hubieran dejando hacer este postre en casa jajaja. During Chol HaMoed (the Intermediate days of Yom Tov), I went ahead and tried to replicate her chocolate decadence. I didn’t have pomegranates, nor raspberries, so I went ahead and garnished it with strawberries. You could also use kiwi. 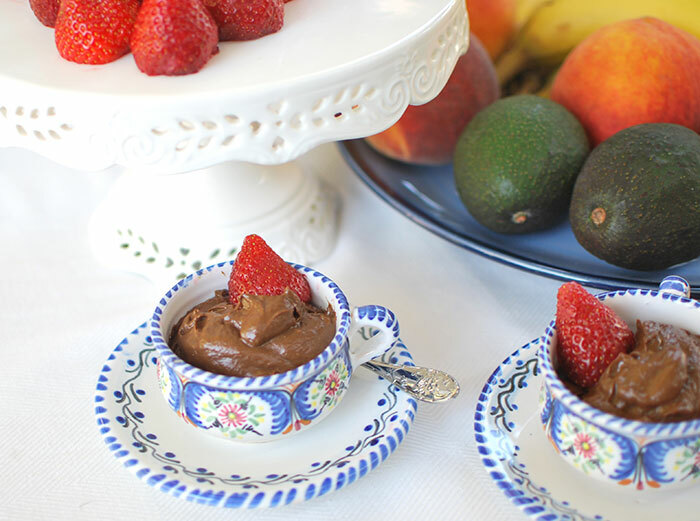 Or, just indulge as is … after all, the only fruit you really need is the avocado! :-). Rosanna had already told me that she played around with a few recipes, and I did the same until I came up with this. Rosanna ya me había dicho que tuvo que jugar un poco con varias recetas, así que luego de que me las envió, hice lo mismo, y este fue el resultado. The original sources that my friend gave me are here and here. I tweaked the recipes until I came up with the above. I hope you are able to try it, and love it as much as we do. Las dos recetas originales, las cuales adapté y terminé con las que le pase hoy, están aquí y aquí. Espero que puedan probarlo y que les guste tanto como a nosotros. Just don’t tell the kids your secret ;-). Sólo no le digan a los chicos el secreto ;-). Have a lovely and healthy week, my dears! Que tengan una linda semana llena de salud, mis amigas.